On the 24th of August, Cameron and I celebrated our 8th wedding anniversary, and we celebrated in three special ways. 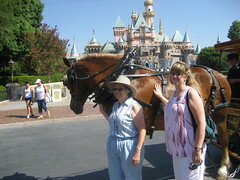 The sharp reader will note that the 24th of August was smack dab in the middle of our recent trip to Disneyland. This was by equal parts planning and happenstance. Ok, mostly the latter. I tried to pretend that I planned it, but Cameron saw right through my thin veil of deceit. 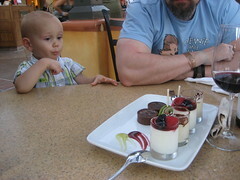 We took advantage of the opportunity, and the Grandma babysitter we had brought with us, to have a nice dinner at Steakhouse 55 in the Disneyland Hotel. It was very good. I had a giant ribeye and a double helping of béarnaise. Unfortunately we have no pictures of this event, as it had been a long day and I started drinking as soon as we sat down. 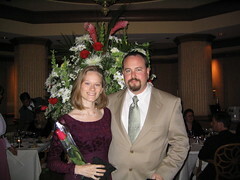 Instead, here’s a picture of us at another fancy restaurant at a different Disney Resort, the week after we got married. 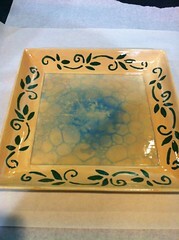 The eight wedding anniversary is traditionally celebrated with gifts of ceramic. When we returned from our Disney trip, we took advantage of Grandpa babysitting and lit out for the Artful Potter, where we made this platter. Lastly, and think most romantically, I took the opportunity of our 8th wedding anniversary to upload photos from our honeymoon. I asked you not to judge me. 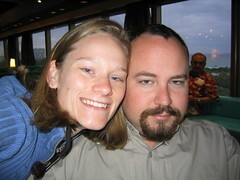 I can’t figure out why, but for some reason, the photos from our honeymoon trip have been sitting on my hard drive for 8 years. It was a great trip. 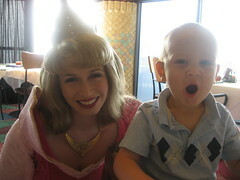 We spent a week in Disney World in Florida, and then a week on a cruise ship in the Caribbean. 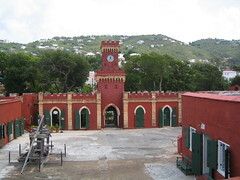 It’s been so long that I don’t know which islands we visited, but for some reason I took an inordinate number of photos at a 400 year old jail during the course of the trip. 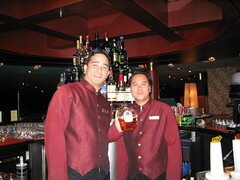 I also made best friends with the bartenders on the ship. Stop judging me! Despite being miserably hot most of the time we were in Florida and the Caribbean, it was one of the most enjoyable trips we’ve been on. 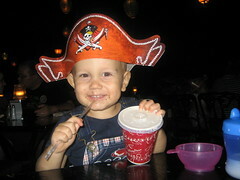 I am eagerly anticipating taking Logan on his first cruise. 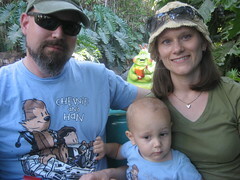 Logan had a two week break from pre-school, and Cameron and I had our 8th wedding anniversary. It seemed like the only appropriate thing to do was go to Disneyland. 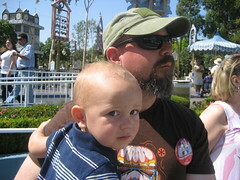 When we took Logan to Disneyland for his first birthday in October of last year, he didn’t really seem to enjoy it much. The rides mostly frightened him. 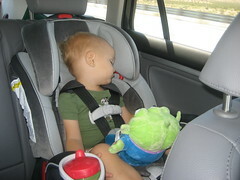 When he wasn’t strapped into the stroller, he was strapped into a high chair. 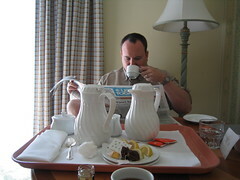 The only time he appeared to really enjoy himself was when he was let loose in the hotel room. 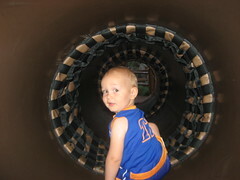 I vowed that we wouldn’t return until he was older and more apt to enjoy himself. Cameron reminded me of that vow in the car while we were winding through Cajon Pass. 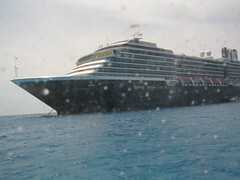 It’s been less than a year since our last trip, and here we were returning. 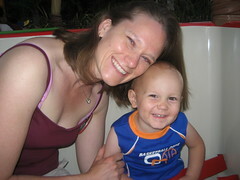 My mother came along this time, to provide some extra hands, and to babysit so we could go on some of the more adventuresome rides together. She brought along her friend Jenny. The two of them met through the penpals section of Western Horseman Magazine when they were 12 and have stayed friends ever since. This week was the 50th anniversary of their first letter. Naturally, they wanted their picture taken with a horse. The horse begrudgingly allowed it. 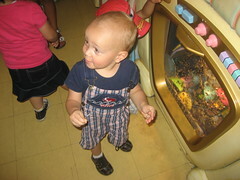 We visited Toontown to see Mickey and his friends. I rarely go to Toontown, and I realized on this trip why. Toontown has essentially no shade. Other parts of the park are lush with foliage, and while still hot during the summer months, there are places to rest out of the sun. Not so in Toontown. 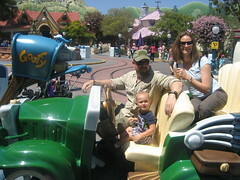 In Toontown there are barely any trees, and everything is made of painted fiberglass that sits in the sun. 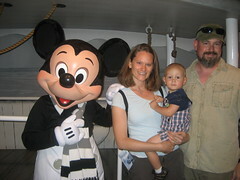 Still, we got to meet Mickey. 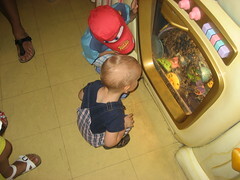 And Logan got to spend 20 minutes being hypnotized by the dishwasher in Minnie’s house. Interestingly, the kitchen was the focal point of Minnie’s House. Mickey’s house, by contrast, didn’t even have a kitchen, and sported things like a writing desk, and a barn area featuring chickens ready for the slaughter. At first I chalked this rather blatant sexism up to an anachronistic Disney world view from decades past. 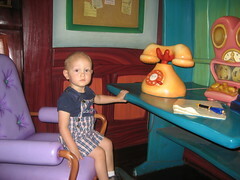 Then I discovered the Toontown was opened in 1993. I’m not sure what to make of that. Despite my politically correct criticisms Toontown is a fun place for kids, who are neither intereseted in the social and political commentary of adults, or properly respectful of the fearsome ball of nuclear devestation that hangs 93 millions miles above our heads. 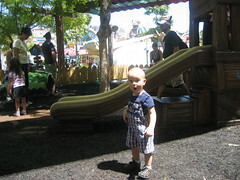 Naturally, Logan beheld all the craft and spectacle of Toontown, and spent the most time playing on a slide. We did the usual meet and greet of characters. 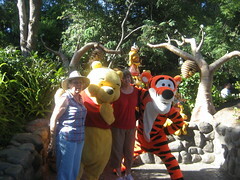 Pooh and Tigger were tracked down in their normal spot, as well as Eeyore. 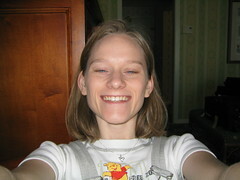 Tigger caused quite a stir when he bounce bounce bounced Logan to the ground accidentally, as Tigger’s are wont to do. At first Logan had no reaction, but when the 7 foot tall anthropomorphic animals in pastel shades of terror attempted to console him, he figured on crying just to be sure. 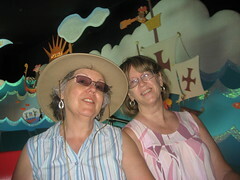 Because it was a Disney family fun adventure, I was forced to ride It’s a Small World again. 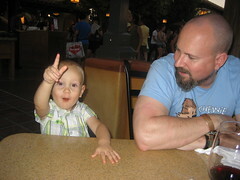 Last time we went, we stayed at the Grand Californian hotel. It’s a nice place with a direct entrance into the Disney California Adventure park. 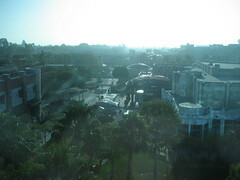 I decided to stay at the Disneyland Hotel this time, for the simple reason that we’d never stayed there before. The Disneyland Hotel is under major renovation. The rooms were nice, but the rest of the property was divided up into inconvenient construction zones and the noise during the day was cacophonic. The pool was nice, the part that was open anyways, with interesting water slides and a zero entry area that kids could enjoy. We have no pictures of this, because cameras don’t like water. In the end, it was a long and tiring three days, but a good time. I seem to have a relationship with Disney that is conflicted. On the one hand, I grew up on Disney films and many of the properties are deeply rooted in nostalgia for me. I love the parks, the sense of magical relocation, and wonder of the spectacle. 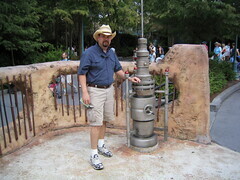 As I get older, I find myself more and more interested in the craft and engineering of the park and it’s attractions. On the other hand, I loathe the crass commercialism of the entire escapade. From beginning to end, I find myself assaulted by the hypnotic appeal to consume for the sake of consumption. I hate the abhorrently long lines that are measured in hours sometimes, with a reward measured in minutes. With a murderous hatred I despise the enormous crowds, most of whom seem to have no idea that they share their immediate surroundings with other people,. They gleefully rebound off other pedestrians, or vapidly block entire traffic ways while their extended family stand in a large circle to discuss how best to get more fat and stupid. On the gripping hand; Soarin’ Over California never fails to erase all that ugliness and paste a nirvanic smile across my face.